Spring Data JPA makes it easy to interact with JPA data sources inside a Spring application. Projections are a mechanism for returning a subset of data from a JPA repository. In this post I’ll discuss a unique way of specifying the desired projection when invoking repository methods. Assume we need to work with two different views of the user inside our application: an in-network view consisting of id, username, fullName, bio and an out-of-network view consisting of id, username, fullName. We’ll create two projections; these are simply interfaces that expose the desired property getters, e.g. Projections are often utilized by adding new interface methods to the repository, e.g. The projection can now be specified when calling a repository method, e.g. If you’re making significant use of projections, consider using this approach to keep your code clean and terse. A working example is available here. In my previous post, we began the process of hosting an application based on ReactJS, Spring Boot, and MySQL inside of AWS. We handled the prerequisites of registering our domain and obtaining a digital certificate. Now we’re ready to host the back end components of our application. 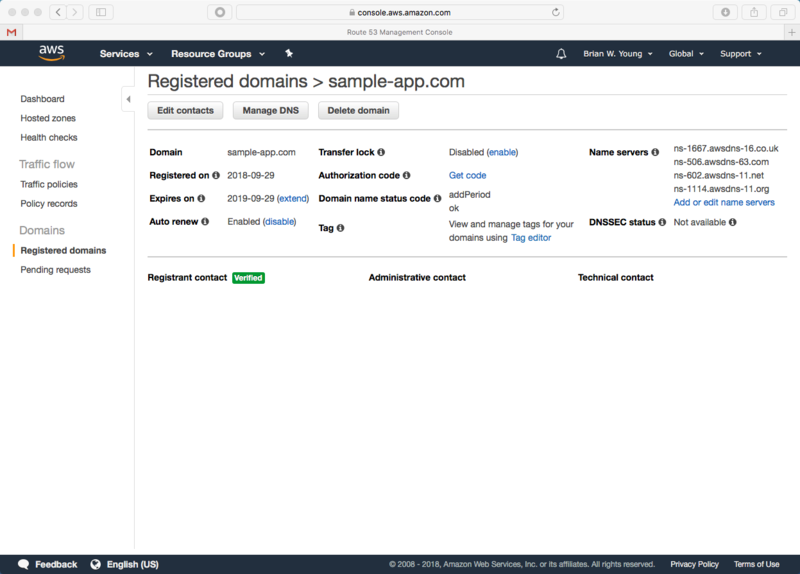 Amazon Relational Database Service (RDS) is an easy way to host a relational database inside of AWS. A variety of database types are supported; for this example we’ll be setting up a MySQL instance. The DB instance identifier is arbitrary. However, you may want to give some thought to naming conventions if you’re as OCD about these sorts of things as I am. Selecting Publicly accessibility allows us to later whitelist our workstation’s public IP for direct access to the database- for example, via port 3306 from MySQL Workbench. Note that this setting name is misleading; the instance isn’t visible to anything outside AWS until specific rules are added. username and password will be needed later in order to connect to the database. Defaults for the rest of the advanced settings are often fine- I don’t advise changing them unless you have a good reason to do so. Before we leave RDS, we need to make a security change that will ultimately allow our Spring Boot application in Elastic Beanstalk to communicate with the MySQL instance. We will edit our instance’s security group and add a rule that allows inbound traffic on 3306 from anyone that shares the same security group. We can also add a rule allowing inbound traffic from our workstation. Elastic Beanstalk is a scalable way to deploy web applications on AWS. The Beanstalk’s Java SE environment is a perfect fit for a Spring Boot application. Note that a variety of other application platforms are supported as well. The sample Spring Boot application we’re using is available at GitHub. Built it with Maven- the result of running mvn install is a single jar file: message-server-1.0-SNAPSHOT.jar. This is the file we will deploy. An application has one or more environments. For example, you might have a dev, qa, and production environment. In this case we’re only creating only one environment. We’ll choose web server environment for the environment type. The web server environment setup asks for help in naming the domain. This isn’t especially important in our case since our front end is going to communicate with the back end via api.sample-app.com, not gibberish.us-east-1.elasticbeanstalk.com. Select Application code: upload code and upload the Spring Boot application jar. At this point, Elastic Beanstalk is going to warn us that our application environment is in a degraded state. Don’t worry about this; we don’t expect things to work properly yet since the configuration is incomplete. To enable our application to communicate with the database, the RDS security group needs to be added. This is the same security group that we modified when configuring RDS. This is also the configuration area that allows us the change the ec2 instance type. For our sample application, a t1 or t2 micro is sufficient. We’ll change our environment to load balanced. The addition of a load balancer gives us a place to establish an https listener. Since we only need one application instance for this example, both the min and max instance counts can be set to 1. 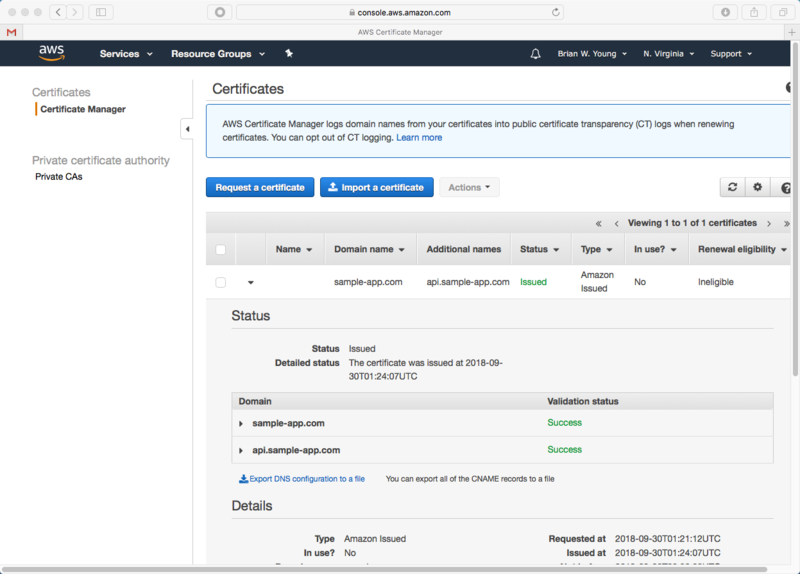 We want our front end to communicate securely with the back end, so we’ll create an https listener and associate our digital certificate with the listener. SSL certificate: select the SSL certificate created earlier. 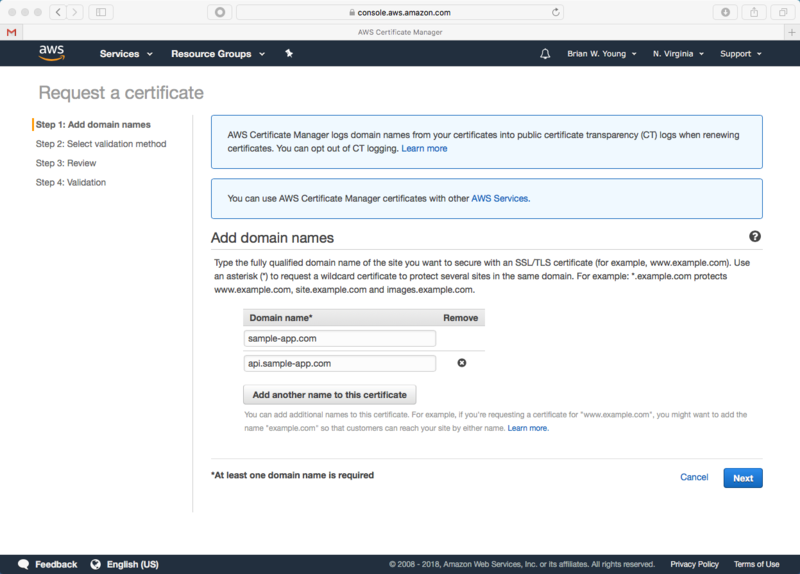 If you recall, we added an alias to the certificate for api.sample-app.com. * The Elastic Beanstalk Java environment uses nginx to map our application from port 5000 to port 80. As a result, the load balancer’s listener(s) communicate with our instance over port 80. By default, a Spring Boot application listens on port 8080, but the Beanstalk is expecting 5000. The path of least resistance (seen in our sample app) is to tell Spring Boot to listen on port 5000 instead. A final note- in production, I recommend removing the http:80 listener from the load balancer since nobody should be communicating with the back end over a non-secure port. I recommend restarting the environment after making the above configuration changes. The environment should be healthy after the restart. We need to pay a follow up visit to Route 53 to create an alias record that points to our Elastic Beanstalk environment. We couldn’t have done this when we first set up our domain since at that point we didn’t have a Beanstalk environment. The alias target field allows us to select our Beanstalk environment from a list. It works 🙂 In my next post, we’ll finish things up by hosting the front end. Amazon Web Services has a number of services that you can utilize to host entire application stack for a production audience. 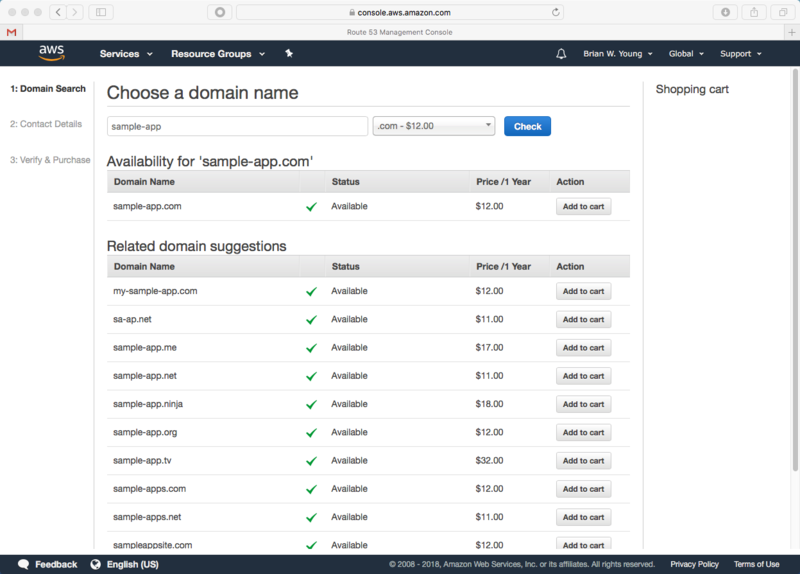 These services add a lot of value beyond simply hosting everything directly in an EC2 instance. Ease of configuration, simplified scalability, system metrics and automated backups are just a few of the benefits. Over the next few posts, I’ll walk you through the recipe I recently employed for hosting a production application built with ReactJS, Spring Boot, and MySQL. The application was built for a software startup; one major advantage of this technology stack is that the entire solution can also be hosted on premises in the case of an enterprise sales opportunity. For the complete walkthrough, I’ve assembled a simple guestbook-style sample application (front end and back end) that demonstrates all the major muscle movements. The diagram below illustrates the end state. Since we don’t want to host the site at a randomly assigned URL, our first stop is Route 53. Route 53 makes it painless to purchase a domain name. Doing this inside the AWS ecosystem vs. externally simplifies things going forward. We’ll register sample-app.com, and our users will visit https://sample-app.com to interact with the application. For a few clicks and the price of a couple of lattes, the domain is ours! The front end needs to be delivered to the end user via https, and communication between the front end and back end also needs to be secure. Certificates that are trusted across all major browsers can be obtained for free via Certificate Manager. Now is the time to give some thought to AWS regions. 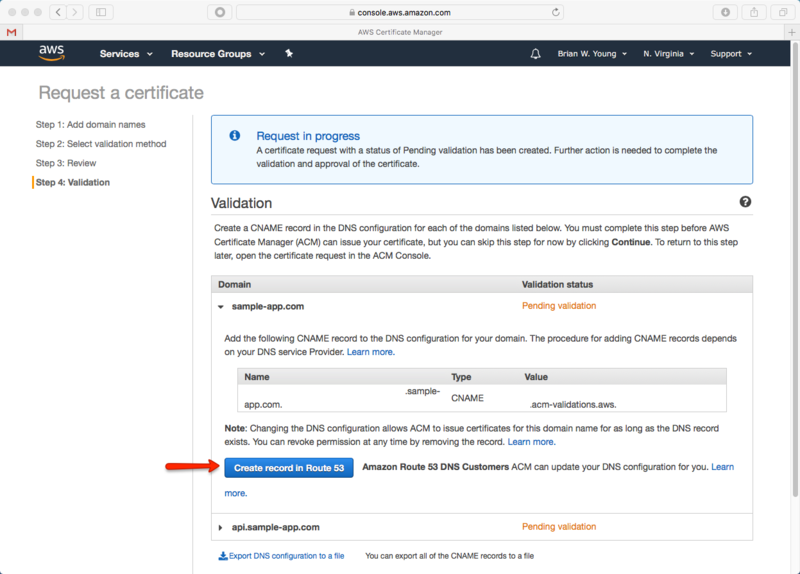 The certificates you create are specific to a region. For this example, we’ll host the entire stack exclusively in us-east-1. We will obtain a single certificate for sample-app.com with an alternate name of api.sample-app.com. As you’ll see later, these names will be used by CloudFront and Elastic Beanstalk, respectively. In my next post, we’ll deploy our RESTful back end to Elastic Beanstalk and host our database in RDS. It turned out that I had missed an opportunity during the initial implementation. The Nashorn script engine implements Compilable, a functional interface that allows you to compile your script. As you can see, the difference is substantial across a test of 10,000 invocations. A batch size of a few million records is pretty ordinary for the system that uses this component, so this represents a huge time savings. I should also mention that the script engine is thread safe. For concurrent use, each thread simply needs to obtain a fresh bindings instance from the engine as shown in the code above. I get the impression that Nashorn may be an underutilized feature in the JDK. However, script-based extensibility in an application can be quite valuable in certain scenarios. Nashorn is worth keeping in mind for your future projects.